Update: Research Information published an article based on my UKSG presentation below. Read it here. The UKSG 2014 Annual Conference and Exhibition took place from 14-16 April at the Harrogate International Centre, Harrogate, United Kingdom. Originally, UKSG stood for the United Kingdom Serials Group. Now that their geographic appeal has grown beyond the UK, and the scope has broadened to include e-books, e-learning and other e-resources as well as serials and e-journals, UKSG have stopped expanding the acronym. I was honoured to participate in the morning plenary on Tuesday 15 April 2014 9:30-10:30 AM BST. My title was “The Impacts of ‘Impact’: challenges and opportunities of ‘multichannel’ academic work”. You can now see it on UKSG’s YouTube channel… [embedded below]. The conference had a lively backchannel under the #uksglive hashtag. I archived the tweets using Martin Hawksey’s Twitter Archiving Google Spreadsheet (TAGS). I have shared the source data on figshare as a CSV file containing tweets tagged with #uksglive from Friday April 11 12-00-51 +0000 2014 to Wednesday April 16 17:24:45 +0000 2014. The dates in the CSV file are GMT (not BST). 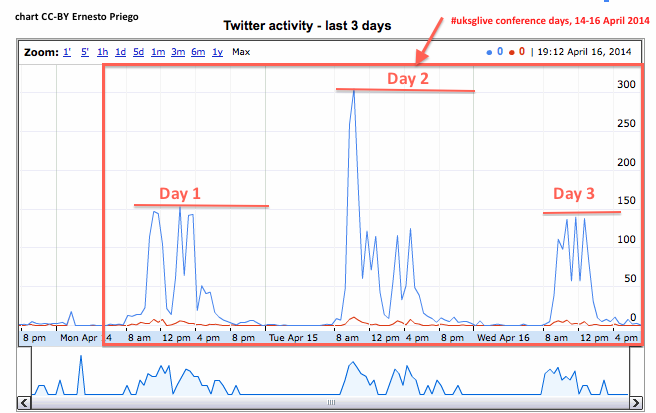 The original archive contained tweets dating back to 9 April 2014 but for relevance this dataset concentrates on the main activity immediately before, during and a few hours after the actual conference. Some of the data has been cleaned but duplications and even one or two spam tweets might have remained. The data is shared as is. 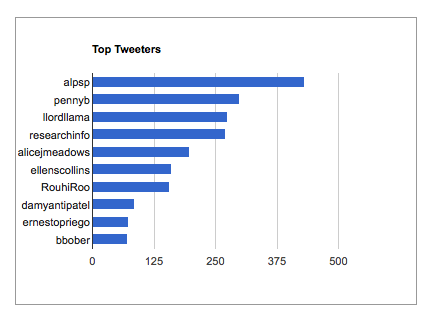 Please note there was also some Twitter activity around the conference using the hashtags #uksg and #uksg14, but those tweets were not included in this collection. If you find this data useful and/or use it for your research, please kindly cite this file as indicated above and share it openly with others. Please feel free to get in touch via Twitter @ernestopriego or by sending me an email via my contact page on this blog. Research Information published an article based on my UKSG presentation. Read it here. Previous Previous post: #LibPub Session 10: Libraries, Publishing: The Future?